In 1984 we were fortunate to see the "Last of the Garratts" on line workings with a day-long ballast train hauled by GMAM Garratt 4088 from Waterval Boven to Breyten and return. These were the most modern Garratts in South Africa and are 4-8-2+2-8-4 wheel arrangement engines. We also see different engines in yard switching duties(Shunting). Next we chase doubleheaded class 24 2-8-4's from Breyten to Lothair with some nice results. Lastly we visit the Randfontein Estates Gold Mine Railway near Johannesburg, where GMAM Garratts work on this Industrial Line hauling gold ore, or reef as it is called in South Africa. Besides the Garratts we will also see a few of the older 4-8-2 engines that were formerly South Africa Railways locomotives. Live audio and informative narration and the last video in our 1984 South African Steam Collection. In 1984 we made a month-long journey to the Republic of South Africa for an adventure shooting regular service steam operations. This was our second trip to this photographers paradise the first being in 1977. Steam in South Africa in 1984 was similar to late 1950's steam in America. It was declining yet there were pockets of great activity and fabulous action. When we photographed these images we had no intent on selling them, therefore there are some flaws, like rough pans, and camera clicks with still camera sounds in the background. These early VHS cameras were not as good as today's equipment of course, and things like color, and sharpness are 1984 technology not 2009. These videos do look better than films, and they have robust natural train sounds that will make you fall in love with South African Steam locomotives. This series was what started us into the railroad video business in 1984, and originally there were 4 hour long videos, without narration, and limited editing. These have not been for sale for several years, but in 2009, our 25th Anniversary, and 25th Anniversary of these videos being made, we have given them a facelift, with proper professional narration, better editing, updated information, and best of all there is more content. In 1984 when these were originally sold we were limited to 60 minute 3/4 inch masters. Instead of 4 hours of content, today these DVD's total nearly 7 hours. Check out the special savings on the set, which is priced nearly $50.00 off the single prices. In 1985 Railfan and Railroad Magazine's editor Jim Boyd stated something to the effect that if you did not like these videos you should not call yourself a steam fan. Remember this is not a fantrip, nor excursion, nor photo special, or festival. This is real everyday steam operations that we captured with live video and audio. If you are expecting state of the art quality, these may not be for you. But, if you love steam and great action, then you may well find these to be your favorite steam videos. Steamboy (Revere MA US) on 2018-03-26 19:24:19. 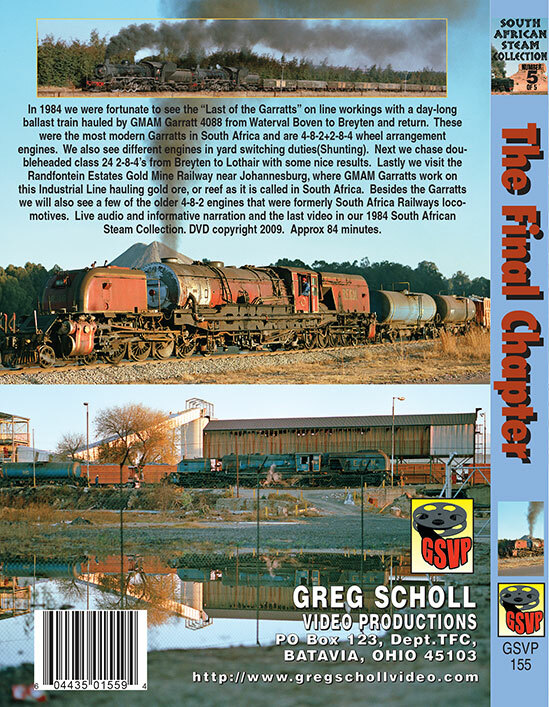 There are 2 reasons why this title was called the Final chapter: one being the final run of the unique Garratts in operation, and it is also the final chapter of Greg's 1984 South African Steam Collection. 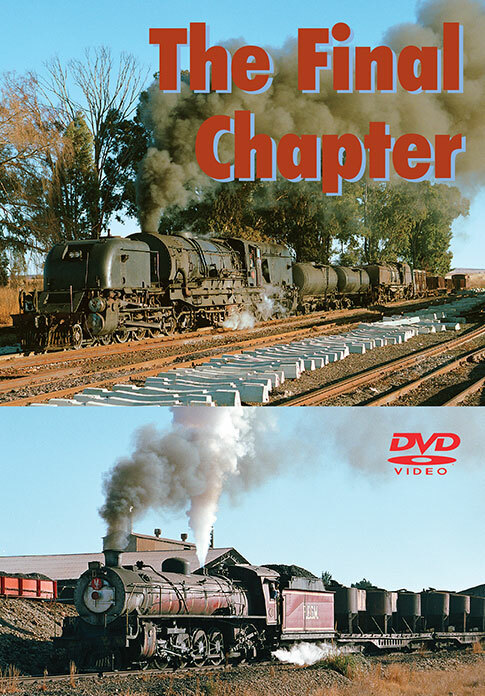 This one features never before seen footages that were never shown in the Original 60 minute Version, as there is yard work, 4088 hauling ballast in the fog, Doubleheading 24NC Class 2-8-4s, and the final day of Greg�s visit to South Africa in 1984 takes us to the Johannesburg mines. The 5 part series (Once 4 in 1984) came to a close with a history of the Garratts, and also the Mine as well. Now as we enter Greg�s 34th year of his business, who knows what would happen when he would not only make some interesting Best of Specials on various steamers he shot in the Business, the year 2019 would mark not Only For Greg�s 35th Year of his business, but also for the 25th Anniversary of the First America By Rail Video, with New and Extended Scenes from upcoming Programs into the New Decade?